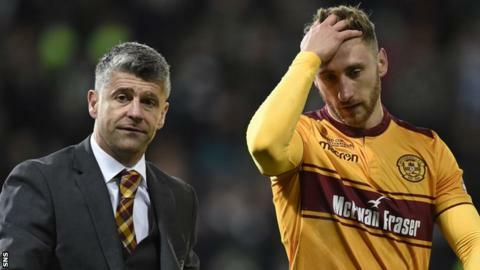 Louis Moult has been ruled out for up to a month, with boss Stephen Robinson admitting the striker could have played his last game for Motherwell. The 25-year-old striker, who has picked up a hamstring injury, is out of contract at the end of the season. "If somebody puts in the right offer for this football club, obviously we have to look at everything and be fair to the player," said Robinson. "But it's not something I can dictate and we just look at what we control." Moult, who joined Well in 2015, is the top scorer in this season's Scottish Premiership with eight goals - and has 14 in all competitions, including a run to the Scottish League Cup final. Top-flight rivals Aberdeen had a bid of around £300,000 rejected in the summer. Former club Wrexham are due a sizeable sell-on fee if Moult is eventually sold and any transfer income would also trigger loan repayments to former club owners John Boyle and Les Hutchison. Those factors would be taken into consideration by Well, who risk losing the player for nothing in the summer, when considering any potential offer during the January transfer window. "We were brave with our decision and we have been more than repaid for that with 14 goals and a cup final and sitting fifth in the league," Robinson said of rejecting Aberdeen's offer. "What happens in January, we can't really control. "If people are willing to pay money with a few months left then we have to look at that. "We have an eye on other things and we have to make sure we are ready for that - and the same if somebody looks at Chris Cadden or Cedric Kipre." Academy graduate Cadden's form has led to six Scotland Under-21 appearances for the 21-year-old midfielder. Defender Kipre has become a regular starter since ending up at Fir Park after the 20-year-old Frenchman left Leicester City this summer. Moult's injury will keep him sidelined until Motherwell's first game of 2018 - a Lanarkshire derby scheduled for 20 January against Hamilton Academical in the Scottish Cup.